Notice the change of date for our next two Lego Block Parties. Due to the holidays, we have moved them to the 3rd Tuesday in November and December. This is a popular program for Lego maniacs. We provide an afterschool snack, many varieties of Legos, and the space to create. We are still looking for 7th and 8th grade volunteers to help the younger children build more advanced creations. Stop in the library to find out more about this opportunity. If you have children interested in joining us, please sign up as space is limited. Our Heyworth Knitters and Crafters are wanting to create blankets for Project Linus. If you are interested in this project, please stop in next Monday evening to learn more. Project Linus National Headquarters is located in Bloomington, Illinois. National President Carol Babbitt and Vice President Mary Balagna direct and orchestrate the activities of Project Linus chapters located across the United States. They also maintain a very busy Central Illinois chapter, donating an average of 350 blankets every month to local children. With chapters in all 50 states, Project Linus continues to grow. Blankets are collected locally and distributed to children in hospitals, shelters, social service agencies, or anywhere that a child might be in need of a big hug. Volunteers, known as “blanketeers,” provide new, handmade, washable blankets to be given as gifts to seriously ill and traumatized children, ages 0-18. It is Project Linus’ policy to accept blankets of all sizes, depending on local chapter needs. All blanket styles are welcome, including quilts, tied comforters, fleece blankets, crocheted or knitted afghans, and receiving blankets in child-friendly colors. Always remember that blankets must be homemade, washable, free of pins, and come from smoke-free environments due to allergy reasons. (projectlinus.org) We invite anyone interested in providing a blanket to a child in need to attend our next Heyworth Knitters and Crafters meeting November 16 at 6:30 p.m.
After School Movies, 3:20 p.m. every Friday the library is open. We are thrilled to offer crafters a space to create and socialize! This group is very willing to teach anyone who would like to learn to knit or crochet. We have yarn, instructions for beginning projects, and needles to get you started on a new hobby. If you want to learn how to knit or crochet you must sign up to attend, so our group can have all you need ready for the evening. If you are a knitter or a crafter looking to socialize with others in our area, just show up as your schedule allows. Available to anyone 4th grade and up. This group is also wanting to provide blankets to a local Project Linus chapter. November and December will be 3rd Tuesday due to holidays. Join us for a presentation by Jestin Nutter, FFA Instructor at Heyworth High School, as he shares his family hobby. If you are a collector and can bring in a small sampling of your American Indian artifacts from Central IL, please feel free to do so. Heyworth History Club, (CHANGE OF DATE DUE TO HOLIDAY) Usually 4th Wednesday mornings at 10:30 a.m.
Monday Evening Book Club, The Predictions by Bianca Zander, 4th Mondays at 6:30 pm. We are always seeking new people to join us! Give us a try, we have a friendly, talkative bunch. It’s a great way to meet new people in town. Books in regular and large print available, as well as audiobook, at the library for checkout, stop in and get yours today. 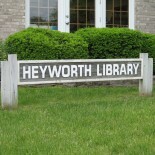 This entry was posted on November 11, 2015 by Heyworth Public Library District.